Specialized training to reduce the stress of visiting the vet. 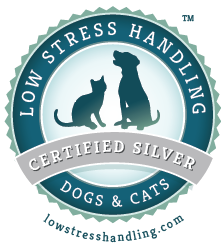 The purpose of Certification in Low Stress Handling is to provide the teaching content needed to understand and improve the individual or veterinary hospital’s ability to create a low stress environment and handle animals in a less stressful manner. Coursework for this Certification goes beyond the expert teachings of Dr. Sophia Yin and includes improvements to the hospital’s design, preparation of and for patients prior to a visit, the use of special tools and sedative agents, and the development of important hands-on skills. Among these skills are the abilities to: recognize the overt and subtle signs of fear and anxiety in dogs and cats, approach and handle pets in a relaxed, non-threatening manner, learn how the sights, sounds, smells, and surfaces in a practice may be increasing the stress of patients, to create a calmer, safer, and more secure environment, and to understand how every interaction affects the animal's perception and willingness to cooperate.